What do you get when you combine a chicken named Elvis, a locked diary, and a secret Violet Parker does not want share with her daughter? 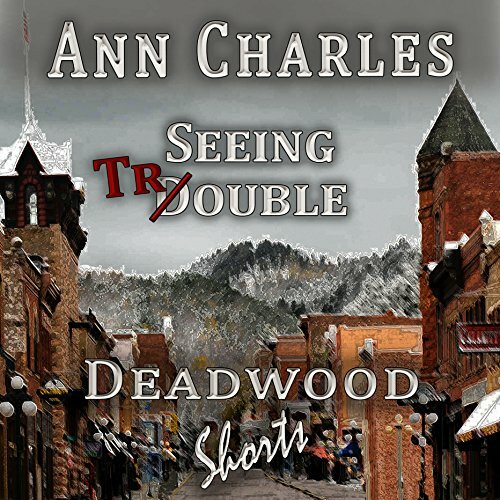 Seeing Trouble is the first of many short stories involving the characters of the Deadwood Mystery series. The new narrator for the wonderful Deadwood series is a major disappointment. She sounds as if she is reading from a script and is not nearly so good as original narrator, Caroline Shaffer. Shaffer made you feel as if you were actually with her and listening to actual conversations. I do not intend to purchase any more Deadwood series books that have such inferior story-tellers. It provides some info that pertains to the series, so yes. But only if it is free, or maybe 99 cents. I wouldn't recommend paying for it. Bonus material like the author's interview with her main character is usually offered at the end of a full length book. You know, as a bonus. Using it as filler to make up for the shortness of the story is kind of a d*** move. Yes, I like the series and the author, Ann Charles. I won't buy the .5 short stories that Audible is offering for this series again. Fool me once, blah, blah, blah. Why not use the usual series narrator? I think that would have been better. Lisa Larsen did a good job, but why not use Caroline Shaffer? It makes Seeing Trouble feel even less like a short story and more like a fragment or an out-take. If you could sum up Seeing Trouble in three words, what would they be? I've listen to the first two books in the series and have enjoyed them. I purchased this thinking it would have some value but it is rehashed backstory for the most part. It would have been appropriate to add as an additional short at the end of the second book. Unfortunately, the backstory didn't provide any insight to the main character, instead offering only casual observation. This was not added value for the series and I don't encourage purchase as it will not further engage a reader.